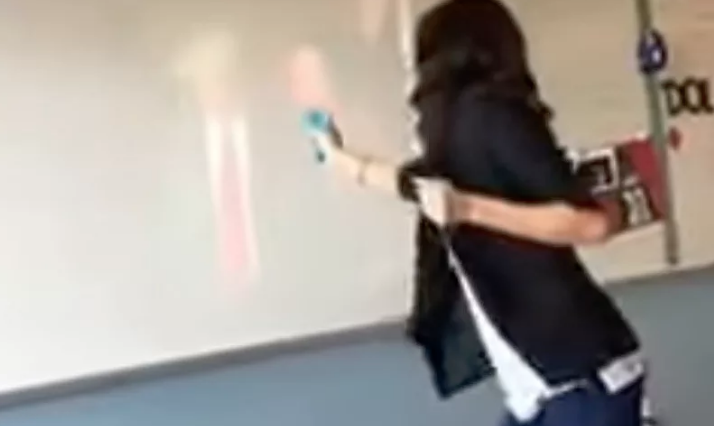 A Dallas teacher is in hot water after a controversial stunt she pulled inside a classroom went viral — a week after Donald Trump was officially sworn-in as president. Tens of thousands of people have seen the video since it was posted online Wednesday, prompting an investigation from officials at the Dallas Independent School District. While the school looks into the matter, officials say Modi will be placed on administrative leave. But that didn’t stop parents from voicing their concerns. “Five of my grandchildren go to Dallas ISD schools...do you have a venue where concerned voices can be heard?” one Facebook user asked. Some students admit Modi’s actions were inappropriate, but ultimately, the majority believe the teacher was just making a joke. “Although her actions didn’t display that she was a good role model, she’s always there and supports my classmates, my peers,” Briana Castillo, a senior at the school, told CBS Dallas. Adamson High School junior Leslie Jaimes told CBS Dallas she was in Modi’s second-period class when the teacher pulled out a squirt gun she had taken earlier from a student. But the school may not feel the same way. As of Friday afternoon, the school had no further update on the investigation or the teacher’s employment status.